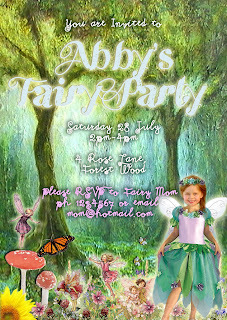 Little girls love fairies, so when Miss Fab turned four, I just had to do a Fairy Party. The invitation instructed the fairies to come wearing their wings. I made colourful flower wreaths for each fairy (see instructions below). Upon arrival there was a selection of makeup to use (glitter, nail polish, lip gloss, hair mascara etc), assisted by the mummies and "Fairy Lydia" - our wonderful regular babysitter who really looked the part and got into her role. 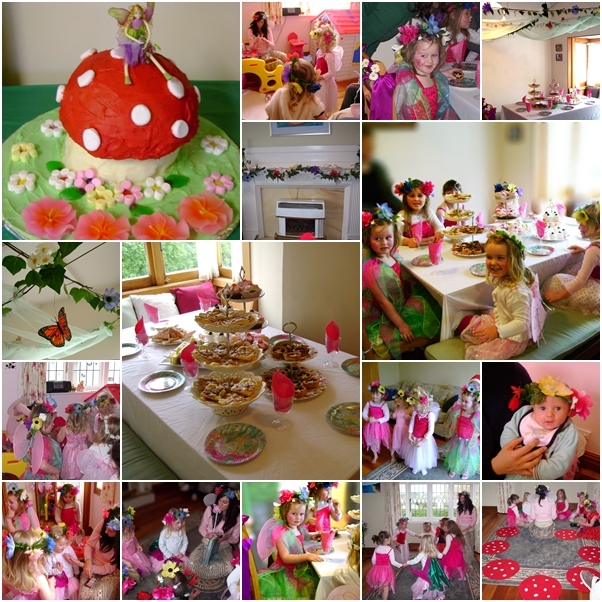 Once the fairies had all arrived and had fun in the beauty parlour, the little fairies moved through into the dining room for the Fairy Tea Party. 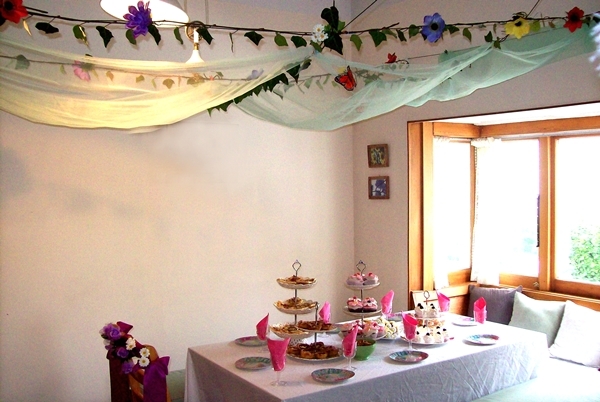 The food was displayed on tiered cake stands, with Fairy Berry Fizz served in jewelled (disposable) wine glasses, all under a canopy of tulle and ivy. 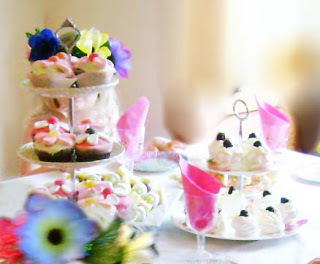 The tea party included meringues with berries and cream, jam tarts, flower cupcakes, daisy pizzas, fruit kebabs and butterfly pretzels, washed down with berry punch..
"Fairy music" was playing in the background, giving it all quite an ethereal feeling (I made my own mix CD, mainly Enya and classical pieces). 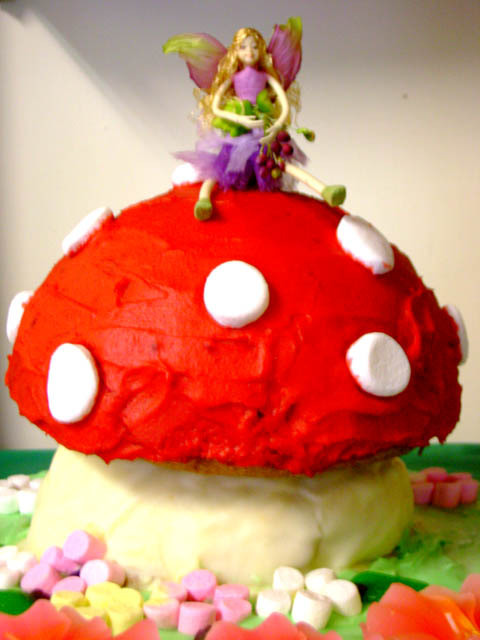 The cake was a fairy on a toadstool (see below). 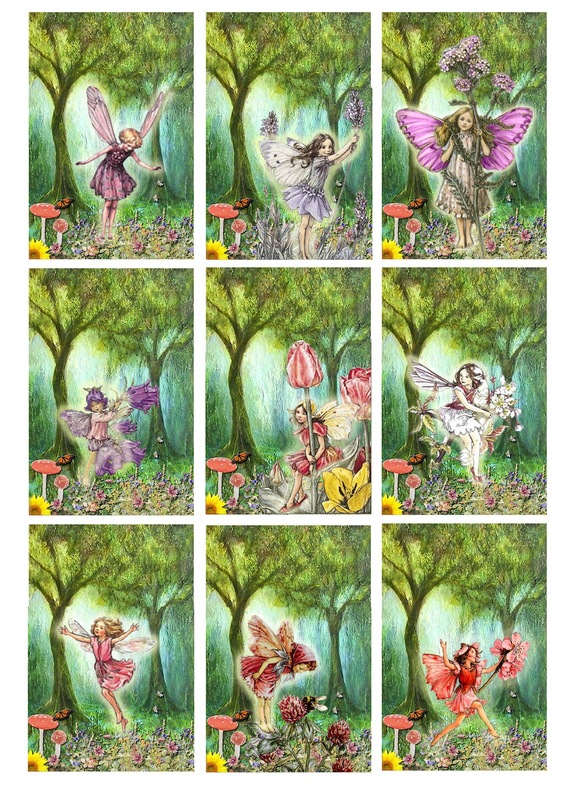 After singing happy birthday and blowing the candles, the fairies moved into the lounge for fairy dancing and games. I did a new take on a couple of old favourites, combining "Pass the Parcel" with a treasure hunt. Between each layer was a rhyming clue directing them to "treasure" hidden somewhere in the room. The hidden items included chocolate gold coins, Hershey's (pixie) kisses, lipgloss and fairy dust (glitter to be sprinkled in each girl's hair). 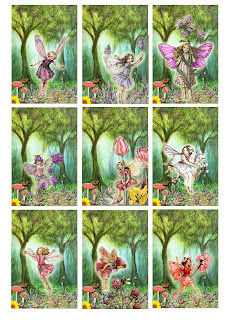 Fairies collected treasure in their fairy kits - (party bag). All in all a magical time was had by all. 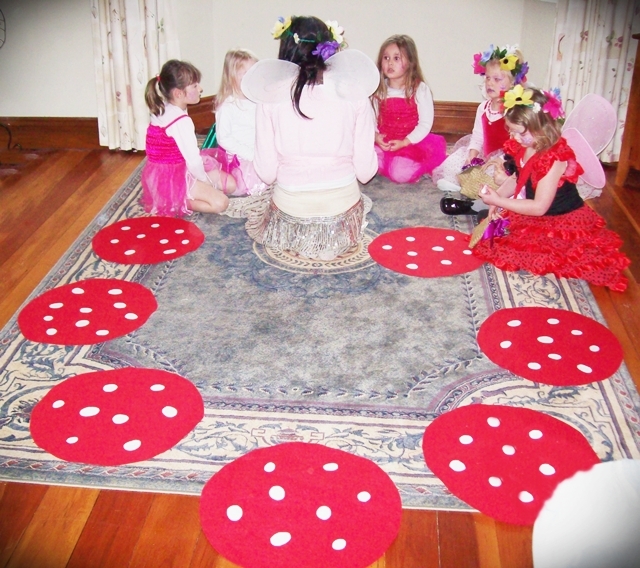 The Toadstool mats for the Fairy Ring are so easy (and cheap) to make. To make eight circular mats you need four metres of red felt*. Cut out large circles of red felt (for toadstools) and small circles of white felt (for spots). Attach spots to toadstool mats with PVA (craft) glue. Great for non-sewers like me! This cake was pretty simple to make and decorate. I used two different sizes of ceramic bowls lined with baking paper: The larger bowl for the top of the toadstool, the smaller bowl for the bottom. Use a double mixture of the Edmonds One Egg Chocolate Cake recipe (alternatively two packets of chocolate cake mix would do the trick). TIP: When cooking a deep cake, cook on a lower heat and take longer without fanbake so that the cake doesn't "burst" at the top, making it uneven (I didn't do this for the bottom cake, and had to trim it. It was slightly lopsided). When the two cakes were cooked and cooled, place the smaller cake on a cake plate and ice with white butter icing. Do this before putting the top of the toadstool on, it's much easier and less messy than the alternative. When the icing is nearly set, position the larger cake on top and skewer the two pieces together with bamboo skewers. Push the bamboo all the way in, 5-6 skewers, until it feels secure, then ice it with red butter icing. (To get a true red use gel food colouring, available at kitchen and cake shops). White spots are marshmallows, sliced in half, stuck on while the red icing is still wet. Alternatively you could use white chocolate buttons. To finish off the look, cover the cake plate with pale green icing and decorate with flowers made from sweets or mini marshmallows. Pink flower birthday candles, completed the look. 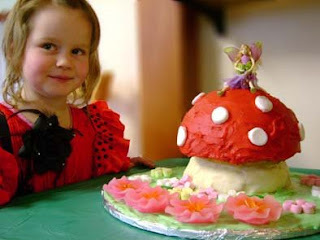 To secure the fairy, wrap some thin wire around the fairy's waist under her skirt and poke it into the top of the cake. Snip off the flowers from the benches leaving a length of wire (and leaves) attached. Cut a length of craft wire and wrap around your own head several times to get the size. (Start with an adults head so that by the time flowers/twists/bends are added it will fit a child.) Twist ends around tightly. Wind the flowers randomly onto the wire "wreath" you have just created to create a colourful garland. Secure the flowers and finish the garland off by covering/wrapping the green electrical tape around the wire. 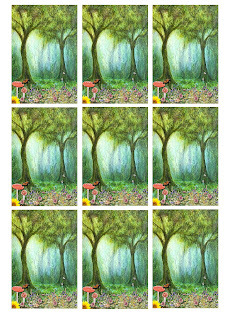 Set up on A4 (210x297mm) ready to print. What a wonderful magical enchanted party! I am going to try to make this cake, thanks for the idea! :) Many Blessings! What a lovely party!!!!! Its so cute, makes me with I had a girl, he he he! awww man I wish I thought of that for Chatterbox's 4th!! I love your party posts!! Looks like it was a GREAT party! Happy Back to Blogging! Oh My Gosh what a fabulous idea for a party! It's a great way to get new followers for your blog, help support the Leukemia and Lymphoma Society, and win some great prizes! I have to say I love this post. Your ideas were amazing and it truly looks like it was a magical party for a very special little girl! Wow - I am beyond impressed!! My daughter would have LOVED that party when she was younger. Actually, even coming up on age 11 she would probably still love it! SO nice! Visiting from the SITS B2B challenge!